Every year the handsome county of Devon offers a hearty welcome to a steady stream of excited holidaymakers all headed for its magnificent beaches and sparkling bays. From the gleaming breaks of Croyde Bay to the sun-kissed swells of Bantham Beach, it’s easy to see why so many of you continue to be swooned by this enchanting region. Always on hand to offer up their expert advice and wisdom are Devon’s hardy bunch of watersports instructors. These dedicated professionals continue to inspire and encourage so many of our guests on their journey into watersports. Whether you’re a solo seafarer, a family crew or a flotilla of friends, Sea Kayak Salcombe can guarantee you an action-packed day on the water. Discover craggy caves and secret gullies as you kayak the South Devon coast towards secluded bays and smuggler’s coves. Receive expert tuition as you master this ancient watercraft, the perfect way to explore this extraordinary and captivating stretch of the South West peninsula. Based on the glorious Salcombe-Kingsbridge Estuary, no one knows the South Hams backwaters better than Singing Paddles. Enjoy the freedom of an open top canoe with enough space for the whole family. What’s more, many of the Singing Paddles trips include campfire cooking, navigation skills and bush craft, as well as providing the opportunity to learn the practicalities of open water paddling. It’s also a great way to build self-esteem, confidence and leadership qualities. Paddles up! Set on the magnificent Salcombe-Kingsbridge Estuary, Waterborn offers SUP tuition and tours led by BSUPA qualified instructors. SUP is currently the fastest growing watersport in the UK, offering a myriad of health benefits as well as providing a serene and versatile platform from which to enjoy a variety of waterways. Sign up for a leisurely paddle along the quiet creeks and secret coves that characterise these charming tidal shores. Drop in on your very first wave with Discovery Surf School, one of South Devon’s top surfing centres. From absolute beginners to those looking to hone their skill set, the ‘Discovery Surf’ coaches are among the most knowledgeable in the South West and are guaranteed to have you up and riding on your very first session. Accredited by the Academy of Surf Instructors, ‘Discovery Surf’ operates at Bigbury-on-Sea and Challaborough Bay where you’ll find a wide range of breaks to suit all levels of surf dude. All equipment is supplied with award-winning Xcel wetsuits for all seasons, shapes and sizes. Set on one the UK’s most popular surfing breaks, the Bantham Surfing Academy is among a clutch of surf schools in Devon to have been classed as a Centre of Excellence by the British Surf School. When you check in with the academy coaches you’ll be in very capable hands, having guided hundreds of surfers through their ranks. If you’ve never surfed before then a beginner’s lesson will help you dial in the basics, if you’re a grom or junior ripper you can progress through the academy’s development system; learning to turn and surf out back in the small green waves before moving on up through the grades to competition level surfing. It’s been described as the ‘ultimate adrenalin rush’, a pulsating combination of rock climbing, bouldering and wild swimming. If you’re looking for an adventure on the Salcombe-Kingsbridge Estuary and would relish the opportunity to explore hidden channels and caves while traversing across rocky outcrops and plunging from brave heights, then a Salcombe Coasteering session is a must. Discover your inner frogman when you embark on this daring escapade. The North Devon coast has become something of a mecca for surfers who flock to its beautiful beaches to ride the ‘gnarly’ Atlantic rollers. The sport of surfing has never been more open and accessible with surf schools popping up all along the Atlantic coast, a great way to get some expert tuition from local surf gurus. Woolacombe Bay is one of North Devon’s most exciting breaks and the ideal setting for your first surfing adventure (also voted Best Beach in the UK by the Trip Advisor Travellers’ Choice Awards in 2016). It’s here that you’ll find the dedicated surf coaches of Woolacombe Surf Centre, an accredited surf school that’s been rated as a ‘Centre of Excellence’ by Surfing England. Why not sign the whole family up for a thrilling surf session and unleash your inner surf dude. The centre also runs coasteering and kayaking adventures, a great way to discover the North Devon shoreline’s secret coves and inlets while making a splash with some adrenaline-fuelled activities. The team at Surf South West have been coaching surfers – of all levels – on the sparkling waves of Croyde Bay for the past twenty-two years. Whatever your ability, be it total beginner or intermediate, Surf South West can offer anything from afternoon surf sessions, weekend courses and week-long packages – they even welcome stag and hen dos. This gregarious outfit from North Devon are another surf school recognised as a Centre of Excellence by Surfing England as well as being the recipient of a Green Tourism Gold Award and a 2017 Certificate of Excellence from Trip Advisor. Described as a ‘surfing mecca’, on the outward tide Croyde offers up thumping barrels and gnarly peaks with good surf all year round. Explore the spectacular North Devon coast and paddle through its craggy coves and hidden inlets with canoe and kayak specialists H2Outdoor. 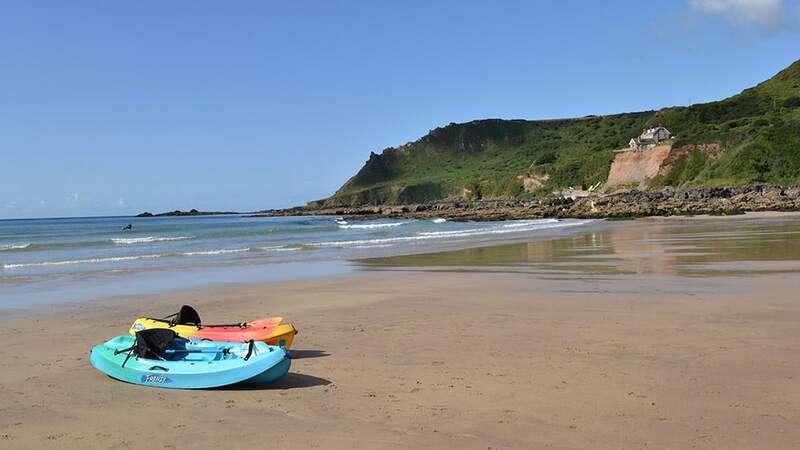 You’ll receive expert tuition as you glide across the crystal blue waters of Watermouth Bay, Lee Bay and Combe Martin, passing sandy shores as you ride the tides and surf the waves, discovering the places only kayaks can reach during your unique tour of this magnificent sweep of the South West coast. All H2Outdoor instructors are British Canoe Union qualified and offer a range of safe but exhilarating open water adventures. No one knows the coastal features of North Devon better than the indomitable coasteering outfit, Active Escape. With more than twenty years of experience behind them, when you partake in one of Active Escape’s adventure tours along the rocky shores of Watermouth Cove you’ll be guaranteed an adrenaline-fuelled excursion full of fun challenges, dare devil plunges and tricky traversing. You can also sign up for coastal rafting, stand up paddle boarding, outdoor adventure challenges and surfing sessions. Make 2019 your year for adventure when you book an action-packed family holiday on the magnificent Devon coast with Toad Hall Cottages.